During the early years of Adolph Hitler’s attempt to take over the world, the empire of Great Britain stood by and watched along with the rest of the world. It wasn’t until Hitler decided to invade Poland in 1939 did Great Britain step up to take on the axis of evil. Almost a year into the conflict, Great Britain replaced Prime Minister Neville Chamberlain with Winston Churchill on May 10, 1940. This move would prove to be fortuitous for Great Britain and the world as Winston Churchill proved to be a leader worthy of the challenge. (World). Winston Churchill did not have an easy job. Shortly after taking over as Prime Minister, France, originally an ally, signed an armistice with Nazi Germany, the disastrous Battle of Dunkirk occurred, and the Blitz and Battle of England reduced parts of Great Britain to rubble (War). Winston Churchill stood steadfast through it all, doing his part to keep morale high and lead his people to victory. Winston Churchill is an excellent example of an authentic leader. He gained the trust of the British people by remaining visible during Germany’s devastating attacks. He visited places all over the country, spending time with soldiers and civilians alike. His ability to interact on a personal level is a key definition of authentic leadership. The interpersonal perspective “stems from the relationship between leaders and followers…it requires not only the actions of the leader but also the actions of the followers in response to the leader. The authenticity here comes from having strong, honest relationships” (Dobbs, 2018). A practical approach to authentic leadership is George's Leadership Approach, which focuses on the characteristics of authentic leaders (Northouse, 2015). These characteristics include purpose, values, relationships, self-discipline, and heart. A leader will fail to be authentic if he does not possess all five of these core characteristics, which references Fig. 3 below. This figure illustrates how each aspect of relates to one another that makes up the foundation of an authentic leader. Each of the five major (outer circle) emotions/behaviors (Pasion, Behavior, Connectedness, Consistency, Compassion) transversely correspond with the meda-emotions (inner circle) (Purpose, Values, Relationships, Self-Discipline, Heart) in both directions. Within the inner workings of this concept illustrates what develops or could be classified as an Authentic Leader and what Sir Churchill incorporated into all of his leadership quilities. Winston Churchill clearly exhibits all five of these characteristics. As he was made Prime Minister during a dark period of human history, his main purpose was to defeat the Nazis. In the first speech he gave as Prime Minister, he states, “I have nothing to offer but blood, toil, tears, and sweat. We have before us many, many long months of struggle and of suffering. You ask, what is our policy? I can say: It is to wage war, by sea, land, and air, with all our might and with all the strength that God can give us; to wage war against a monstrous tyranny, never surpassed in the dark, lamentable catalogue of human crime. That is our policy. You ask, what is our aim? I can answer in one word: It is victory, victory at all costs, victory in spite of all terror, victory, however long and hard the road may be; for without victory, there is no survival” (Winston, 2009). His personal values in defending the innocent and preventing the spread of hate are reflected in this statement to the House of Commons in 1940, “Hitler knows that he will have to break us in this Island or lose the war. If we can stand up to him, all Europe may be free and the life of the world may move forward into broad, sunlit uplands. But if we fail, then the whole world, including the United States, including all that we have known and cared for, will sink into the abyss of a new Dark Age made more sinister, and perhaps more protracted, by the lights of perverted science. Let us, therefore, brace ourselves to our duties, and so bear ourselves that, if the British Empire and its Commonwealth last for a thousand years, men will still say, “This was their finest hour” (Docktor, 2015). Winston Churchill had to keep Great Britain united during the Nazi’s bombardment. His relationship with the public helped everyone keep calm and carry on. Known as a “man of the people...Churchill remained as heartening, even endearing, a figure through the years 1941-45 as he had been in 1940. He was a popular character, an eccentric of the traditional type. His sonorous and rousing speeches were unlike anyone else's, and his manner of delivery lent itself to admiring imitation” (Best, 2011). 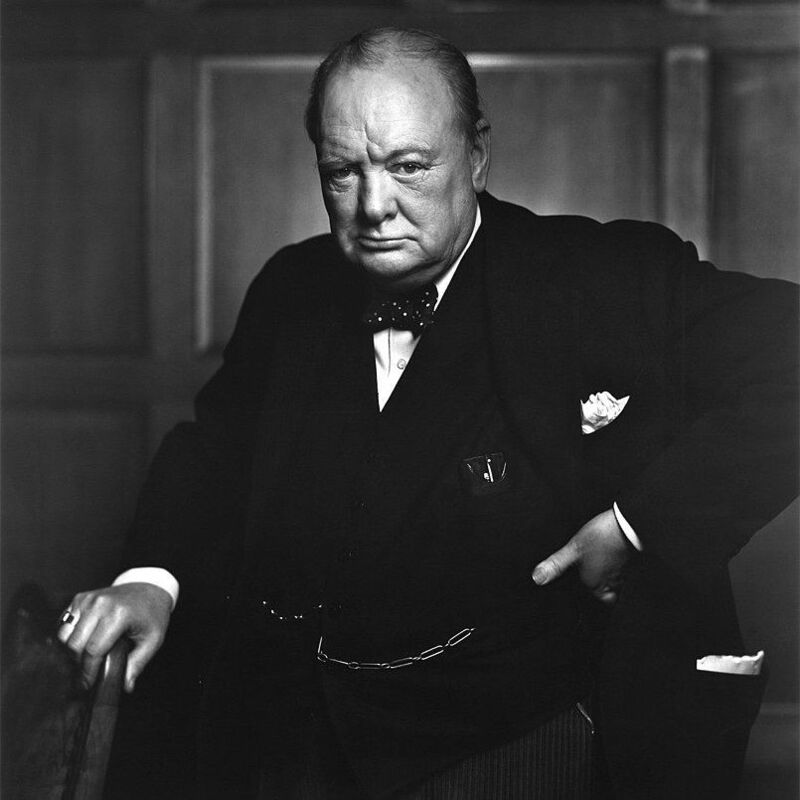 A leader with as much at stake as Winston Churchill requires a great amount of self-discipline, which can be seen in the fact that he suffered from a speech impediment when he was younger. Known as an amazing orator, he spent hours practicing, even winning a contest by memorizing and reciting 1300 lines of poetry, which helped him overcome the impediment. His private secretary stated that in preparation for a speech, “devoted one hour of preparation for every minute of delivery” (Anderson, 2008). Finally, Winston Churchill’s heart not only led him to stop tyranny, but also save the animals that served Great Britain’s soldiers during WW1. When WW1 ended, thousands of horses were stranded in harsh, dangerous conditions. When Winston Churchill discovered there was trouble getting the horses back to Britain, he intervened and was able to secure transportation for 9,000 horses per week (Hastings, 2011). Winston Churchill’s leadership style is further supported using the theoretical approach to authentic leadership. Walumbwa and associates identified self-awareness, internalized moral perspective, balanced processing, and relational transparency as the four components that form the basis of authentic leadership (Northouse, 2016). Churchill demonstrated self-awareness and had a basic understanding of his own strengths and weaknesses. Characteristics of self-awareness include self-confidence, realistic self-assessment, and a sense of humor about who you are and your capabilities (Taylor, 2013). Internalized moral perspective is staying true to one’s moral compass. Winston Churchill was passionately opposed to negotiating with Hitler. Despite pressures from his wartime cabinet to consider mediation as well as difficult battles such as Dunkirk forcing him to evaluate the future of Britain and its people, Churchill remained steadfast in his position. He firmly believed that Hitler would renege on any promises or agreement. “When will the lesson be learned? You cannot reason with a tiger when your head is in its mouth!" As Prime Minister and Defense Minister, Churchill frequently and objectively considered other opinions, otherwise known as balanced processing. While Churchill tended to dominate, he always encouraged discussion and never penalized anyone from disagreeing with him. Churchill’s own self-criticism and independence of judgment, combined with his habit of seeking advice and criticism, led him to change his mind from time to time. As noted earlier, he once said – and meant – “I would rather be right than consistent” (Hayward, 2010). Relational transparency is about communicating openly and being real in relationships with others (Northouse, 2016). Churchill communicated honestly, openly and clearly with his followers and constituents and also also liked to deliver bad news personally. One of his most challenging moments of the war was when it became apparent that a second front against the Germans in France could not be opened up in 1943, as had been promised to Stalin. Churchill decided to go to Moscow to tell Stalin personally. “It was like taking a lump of ice to the North Pole,” Churchill said (Wilson, 2010). Factors such as psychological capacities (confidence, hope, optimism, and resilience), moral reasoning (ethical decision-making), and critical life events also influence one’s ability to become an authentic leader (Northouse, 2016). The key to Churchill’s courage was his unbounded optimism. “I am one of those,” he remarked in 1910, “who believe that the world is going to get better and better.” “All will come right” was a favorite phrase. He repeated it often in the darkest days of World War II, and he seldom ended a wartime speech without a ringing note of optimism (Hayward, 2010). Churchill became Prime Minister the very day that Hitler invaded France and the Low Countries. He was under no illusions about the enormity of the task that lay ahead. Churchill, as both Prime Minister and Minister of Defense, was in a powerful position. With full oversight of the armed forces (the United States Army, the British Royal Navy, and the British Royal Air Force) as well as the government of Great Britain as War Leader, Churchill had the psychological capacity and moral reasoning to react to this critical life event, developed the four qualities of authentic leadership, and engaged in authentic leadership (Dobbs, 2018). Northouse, P. G. (2015). Authentic Leadership. Leadership: Theory and Practice, 7th ed. (pp197). Thousand Oaks, CA: SAGE Publications, Inc.